For now, all you know is you want to feel the coolness of a floor touching your feet. And you've never liked carpet anyway. So where does this leave you when trying to pick new flooring for your home? With eight choices: ceramic, concrete, cork, engineered wood, laminate, linoleum, solid wood and vinyl flooring. The first four are presented here. You're smart to consider each choice carefully; flooring sets the tone for a room's comfort and style, and it can range in price from surprisingly affordable to considerably expensive. Beyond the criterion of looks, think about how much daily wear and tear the floor will absorb and how much time you want to spend maintaining it. There is much to find appealing about ceramic: it's sleek, simple to care for and durable, though not immune to cracks. Ceramic is equally at home in foyers, hallways, bathrooms and kitchens. Compared with other flooring choices, it’s also relatively expensive, which is why it pays to thoroughly review the color choices before settling on a pattern. It wasn't long ago the only place homeowners wanted to see a concrete floor was in their garage or backyard patio. But today – perhaps because the material is widely used for kitchen counters – concrete is enjoying a rebirth. It should outlast any other type of flooring, and easier to maintain than ceramic. Even the one drawback – the blandness of gray concrete – easily can be overcome with stained and stamped effects. When done right, these treatments can trick your eyesight by resembling marble and stone. You infer correctly: for a soft, cushiony floor that springs back to form, cork is impossible to beat. These same qualities also make cork superb at absorbing vibrations and sound, which may be considerations if you're trying to quell the effects of a budding musician or a noisy home theater. 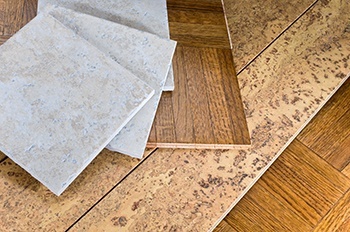 Cork flooring can be purchased in tile form, and in a wide variety of styles and colors. The nonslip surface makes cork a compelling choice for kitchens and bathrooms. Think of engineered wood flooring as an alternative to wood flooring. It is so named because it is engineered with a very thin layer of either bamboo or wood laid over plywood, making it an affordable alternative to genuine wood flooring. The finished look can be similar, but engineered wood is not as durable as solid wood and can dent relatively easily and wear unevenly. Inspect this choice carefully; the floor can be refinished only if the top layer of veneer is thick enough to withstand the effort. Once you decide which flooring suits your home and lifestyle best, you can find a window shade to complement your selection with the help of the window experts at Polar Shades. This is a company that not only measures and installs its own shades, it manufacturers them too, meaning that as you admire your new floor, you can be proud of the fact you've purchased the highest quality shades made in America.